Long before the digital age, safeguarding correspondence and important documents from prying eyes was a concern. Research by Jana Dambrogio, MIT Libraries Thomas F. Peterson, Jr. (1957) Conservator, has revealed that for centuries “prominent figures as well as everyday people” deployed clever methods to deter snooping into private written communications. 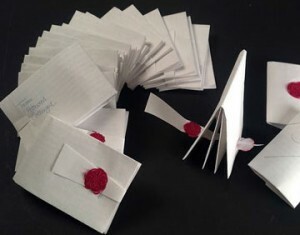 In historical collections worldwide, Dambrogio has uncovered hundreds of examples of what she calls “letterlocking”: elaborate techniques that involve folding, cutting, and sealing messages written on paper and parchment. Dambrogio first encountered letterlocking while a fellow in the Vatican Secret Archives. She found letters from the 15th and 16th centuries with peculiar slits and sheared-off corners. Close examination showed some documents had been folded and “locked” by piercing a paper security tab through a slit, wrapping, and sealing it shut with wax. Dambrogio began turning up other examples of letterlocking in such collections as the British Library and Harvard’s Houghton Library. She learned that Queen Elizabeth I, Galileo, Marie Antoinette, John Donne, and MIT’s own William Barton Rogers, among others deployed letterlocking techniques. In addition to developing a dictionary of letterlocking, Dambrogio employs replicas of locked letters in her teaching sessions. A recently uncovered European archive promises to show “letterlocking like you’ve never seen it,” she said. And a book is on the way. Dambrogio admits feeling “evangelical” about an area of study obscure even to fellow scholars. “This is such a brand-new field,” she said.